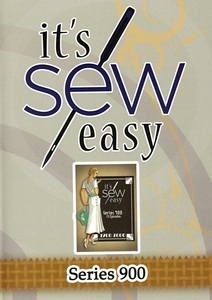 It’s Sew Easy, Series 900 continues to trace fashion and sewing through the historical events, cultural influences and trends of the 20th century. New attitudes, new lifestyles and new technology changed what women were doing and wearing. Our sewing experts show how fashion fit, necklines, hemlines, accessories and embellishments all changed through times of war and economic ups and downs. Each week, sewing and design experts, featuring Angela Wolf, show how to use time-honored techniques together with the latest sewing tools and technology to create today’s hottest fashions. Vintage fashions still inspire today’s designers. Rebecca Kemp Brent shows how to make an elegant lantern purse perfect for an evening out then and now. Kathy McMakin sews a precious turn-of-the century child’s day gown quickly and easily using today’s serger techniques. Supplies were scarce during the first World War. Fabric details replaced laces and trims. Londa Rohlfing shows how to create beautiful ruching for a contemporary blouse. Terry McFeely uses fabric and feathers to make a charming fascinator hat. Joanne Banko uses the cording foot to add extra flair to home decor. As the 1920’s roared in, women bared their shoulders and danced to the latest jazz. Angela Wolf creates a cutwork tank top using today’s computer software and digital cutter. Amber Eden adds color and detail to a classic black sheath dress with silk flower embroidery. Sleeves became important as women spent more time outdoors and synthetic fabrics became popular. Angela Wolf shows how to change a pattern to add batwing sleeves. Then she shows how to create bishop sleeves, inspired by eastern European folkwear. Hollywood designers and glamorous starlets set the trends as people flocked to the movies in the 1930’s. Rebecca Kemp-Brent shows how to recreate any neckline for a whole new look. Angela Wolf embroiders fabric to create a gown for the red carpet. Joanne Banko shows how to join lace, ribbon and fabric with the edge joining foot to get a designer look. During World War II, feminine fashion took on a more masculine look. But women added feminine touches. Joann Banko creates embroidered lingerie. Then Heather Valentine shows how to top off boots with a lacey cuff. Joanne Banko adds beads and trims with the pearls and sequin foot. Figure-hugging, fitted bodices and full skirts defined 1950’s fashion. Peggy Sagers adds French darts to a top for a perfect fit. Pearl Krush creates the iconic poodle skirt for an 18” fashion doll and Joanne Banko uses the couching and braiding feet to add style and color to a tote bag. The 1950’s look is all the rage today. Designer Courtney McCrone adds retro 50’s details to dresses, blouses and accessories. Embroider a sweater to capture that rock ‘n’ roll look – Marie Zinno shows how. Joanne Banko shows how easy it is to create custom piping for garments, accessories and home décor using the piping foot. Technology moved fast during the 1960’s and everything from hemlines to rocket ships went up. Angela Wolf turns modern art into wearable art as she makes a color-block mini-dress. Peggy Sagers shows how to design and make the comfortable and flattering wrap dress, a staple in every working woman’s wardrobe. Fashion rules went out the window in the 1970’s. The t-shirt made the statement for day wear. Joanne Banko creates a custom embroidered t-shirt for a special cause. Jumpsuits were all the rage and are in again. Angela Wolf shows how to create a jumpsuit by combining existing pant and top patterns. In the 1980’s, designers took their cues from active wear, workout clothes and easy care fabrics. Angela Wolf adds a sassy peplum to a basic t-shirt to add swing and style. Cindy Hogan uses the latest digital cutting technology to create appliques for a go-everywhere denim jacket. Fashion trends were being recycled. Casual chic and grunge were in, as long as the garments had the right designer label. Rebecca Kemp-Brent creates a designer quilted tote bag with free motion stitching on a quilting frame. Londa Rohlfing gathers fabric with elastic thread to make an easy-to-wear peasant blouse. Joanne Banko uses bobbin work to create a hand-embroidered look on garments and accessories. As the new century dawned, fashion had gone from corsets to spandex pants in just 100 years. Even dogs were getting dressed up. Paulette Bell creates a customized dog coat using machine embroidery. Angela Wolf adds a hand warmer to work-out wear for today’s trendy touch.